To make sure our last tea pairing was a memorable experience, we reached out across the Rockies for a taste of the Wild West. Calgary-based Tearrific not only hand-blends many of their teas in small batches, they also sell them out of Canada’s only loose leaf tea food truck — The Tea Wagon. Putting a new twist on a traditional favourite is something we admire, and we knew Tearrific teas would get along swimmingly with our shortbread. We were not disappointed. Your taste buds will do a happy dance when they meet these two fresh flavours together. The Lavender Earl Grey blends lavender, black tea and cornflower petals, for an invigorating effect. Paired with our zesty lemon shortbread, the Lavender Earl Grey is sure to make you feel lighter on your feet. Tea Lovers Recommend: Tearrific uses this tea in their aromatic London Fog. Try it yourself at home by replacing one third of your hot water with steamed milk. This bright tea with apple pieces and healing calendula is bold enough to stand alone. But with its natural sweetness and crisp fruity flavour, the Caramel Apple Rooibos makes a delicious match for our creamy original shortbread. The smooth simplicity of the shortbread is the perfect canvas for this colourful tea. This soothing duo is sure to make your worries melt away like ice cream on a hot day. The tea’s simple blend of chamomile, peppermint and lemon balm is a light, breezy counterpart to our shortbread’s warm, indulgent palette. Curl up on your front porch with a book and this pair, and you’ve got the perfect summer evening. This combination might be better than your grandma’s homemade pie. Papaya and strawberry pieces, lime and blackberry leaves are just a few of the summer-fresh ingredients in this fruity black tea. Fragrant jasmine and safflower add to the bouquet. Sweetening the deal is our caramel shortbread. This pair gives traditional summer desserts a run for their money. For a full menu of Tearrific’s vibrant flavours, visit their website. And, of course, after trying all these pairings, you’ll need to stock up on your Rose’s Shortbread. Jenny Lo, of Oollo Tea, is serious about oolong. Tea farming has been in her family since her great, great, great grandfather founded a tea farm in the Golden Mountain Region of Taiwan, in 1913. Now based in Vancouver, Jenny travels the world in search of the highest quality oolong, which Oollo buys directly from farmers. With a focus on quality, fair trade and sustainability, Oollo teas feel as good as they taste. We tried two of Jenny’s favourites, and of course, we think they’re a perfect match for our shortbread. This silky smooth tea, grown in New Taipei, Taiwan is perfect for a cool summer evening. A peachy flavour with honey notes dominates, while a subtle nutty flavour keeps the tea grounded. The sweet, nutty combination pairs deliciously with the smooth texture and rich flavour of our chocolate shortbread. Be careful, though—you might find yourself refilling your cup, and your plate. 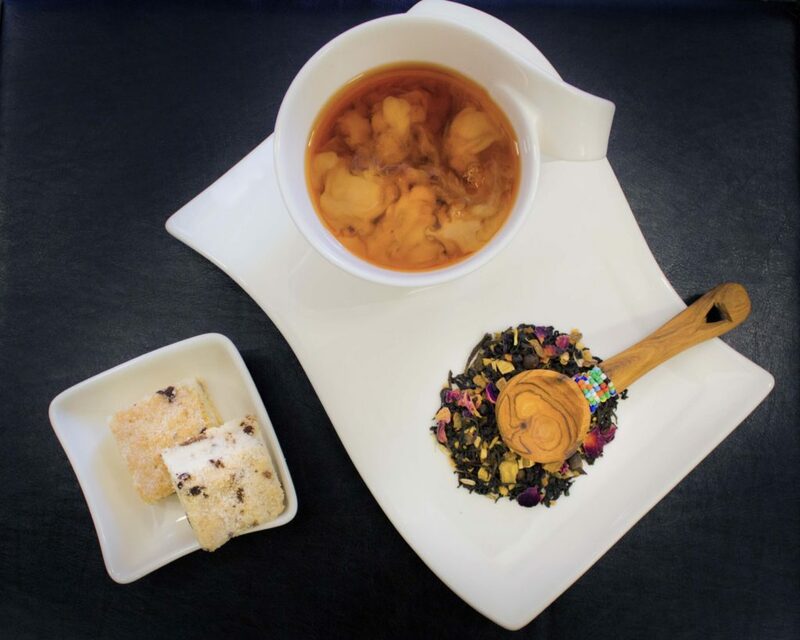 This high altitude tea, grown 1600m up, in Nantou, Taiwan scales new heights with its delicate floral flavour. Hints of earthy grass and vanilla add depth to this light-yet-complex tea. Our sweet, smooth caramel shortbread makes a fine pairing for the High Mountain oolong, adding warmth and body to this rarified tea. To taste Oollo teas for yourself, or to learn more about their selection process, visit their website. Stock up on your favourite shortbread (we know you want some more) here. There aren’t many west coasters who haven’t heard of Murchie’s Tea. Founded in New Westminster over 120 years ago, the company is not only a part of our heritage, they are a favourite part of our present-day tea collections. We sat down to tea and shortbread with Murchie’s Sarah Vaughan, who brought along four Murchie’s classics: Lavender Gelato, CBC Radio Blend, Murchie’s Afternoon and Russian Caravan. Let’s just say we created some pairings of historic proportions. Here are Sarah’s sophisticated pairing notes. This herbal tisane (naturally caffeine free!) has a smooth vanilla base that matches very well with the pure, sweet butter taste of the Original shortbread. The lavender is not overpowering; it just floats over top of the combination. I recommend steeping this rooibos blend for 5 minutes to get full flavour. I typically like it with milk, but with the rich shortbread, I’d keep the tea neat. This was my favourite pairing! CBC Radio Blend is a blend of green and black teas—a combination fairly unique to Murchie’s. The tea has jasmine floral notes, a solid base of black teas, and just a hint of natural citrus flavour. This could become an afternoon addiction. The tea has a light briskness that helps balance the beautiful sweetness of the caramel. It’s a traditional pairing for a delightful afternoon tea! Sometimes bold flavours need to be paired with bold flavours! Chocolate is so distinctive and rich, it needed a distinctly bold tea to pair with—hence our smoky Russian Caravan. I don’t know what it is with the odd combination of savoury smoke and sweet chocolate, but it just makes each flavour boom. To learn more about Murchie’s storied history, and to browse their vast selection of teas and coffees, visit their website. And of course, you can find more of your favourite shortbread here. Do you ever take a look at your tea cupboard and feel, well, uninspired? Tea Sparrow to the rescue! This tea subscription company delivers a curated monthly selection of teas straight to your teapot. With a top British tea sommelier on the selection committee, you are sure to receive only the best tea the world has to offer. We couldn’t resist pairing some of Tea Sparrow’s favourite teas with our favourite food: shortbread. 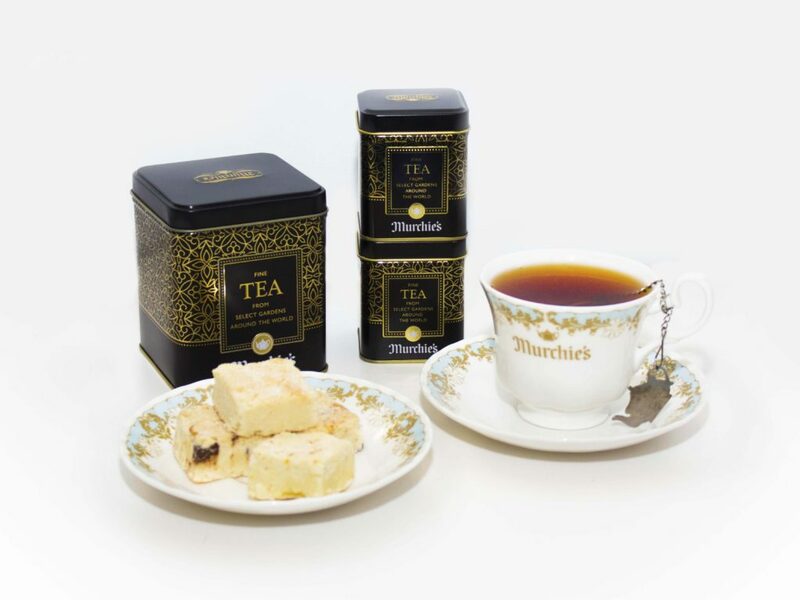 This almond-infused China black tea incorporates ceylon and coconut rasps to create a marzipan-like flavour that plays sweetly with our original shortbread. It’s a double-dose of childhood memories, wrapped in a delectably grownup package. Sencha, candied pineapple and walnuts combine to create this simple-but-satisfying green tea. Its nutty flavour compliments the shortbread’s sweet, chewy caramel flakes and creamy texture. This pairing is smooth and smoother. Pink rose petals and black tea leaves give this tea its dusky, subtly floral flavour. It’s “delicate wine essence” pairs perfectly with the notes of dark chocolate in our shortbread. We’re not holding back here: this pairing could be the new wine-and-chocolate. Listen to your breath as you savour this summery, uplifting blend of bamboo leaves, strawberries and other fruity and floral flavours. Lemongrass elevates the fresh citrus essence of the shortbread to a state of enlightenment. Find your zen with this divine pairing. To get the world of tea to your door visit Tea Sparrow’s website and don’t forget to top up your supply of Rose’s Shortbread! Tea Ave might be a Vancouver-based company, but their delicious oolong teas have their roots, quite literally, in Taiwan. The company’s brother and sister team, Jeff and Heidi Chen, were born and raised in Taiwan, where their love of Oolong was formed, and they source their fragrant teas directly from tea farms in their home country—one of the best places in the world for growing tea. For today’s pairing, Tea Ave selected three of their favourite teas to complement our shortbread: Oriental Beauty, Ginger Lily Oolong and Rose Oolong. 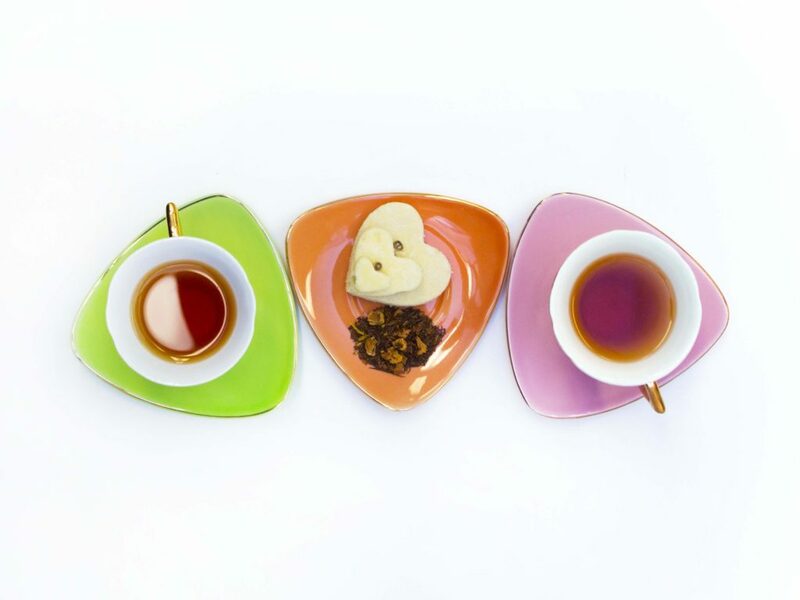 The colourful leaves of Oriental Beauty Oolong, when steeped, produce a fruity flavour with subtle honey notes. This combination of bold and mellow pairs beautifully with the smooth sweetness of our caramel shortbread. Both Oriental Beauty and Roses’ Shortbread are processed entirely by hand, making them an extra-special treat when enjoyed together. To produce this tea, Taiwanese Ginger Lily blossoms are blended with high mountain oolong tea. The light, sweet ginger finish produced by this combination is the perfect way to follow up a bite of our bright, tangy lemon shortbread. It’s “summer in a cup” meets “summer in a biscuit”. 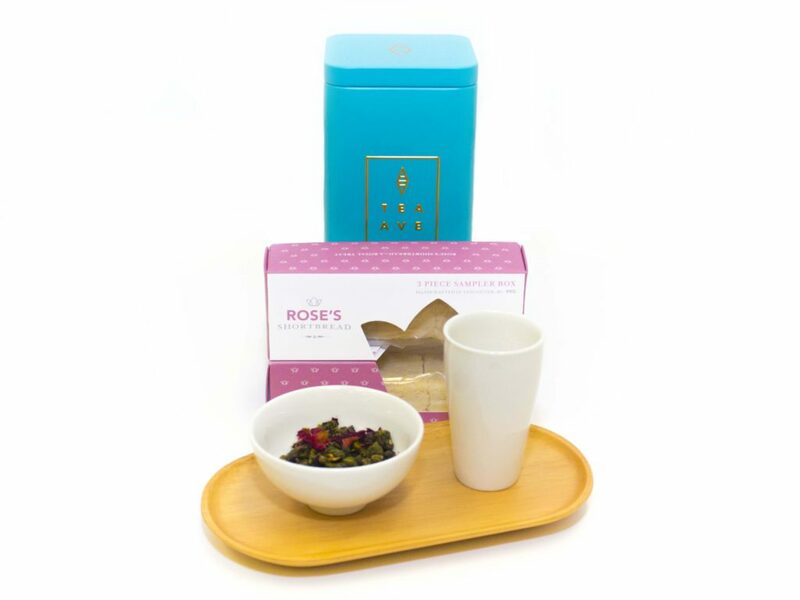 Fresh Taiwanese roses and mountain oolong combine to create this elegant tea. The pure, creamy simplicity of our original shortbread provides the perfect backdrop to bring out the delicate floral notes in this full-bodied tea. 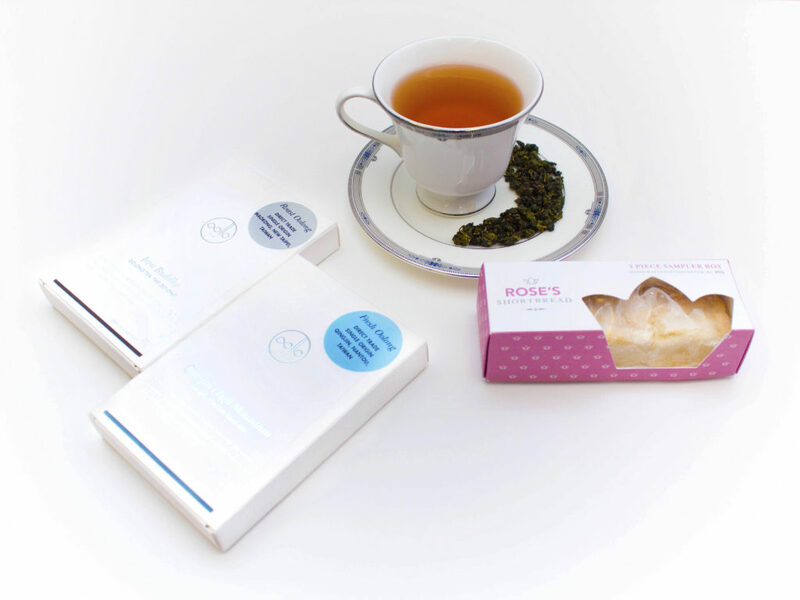 Try Tea Ave Oolong Tea and Rose’s Shortbread At Home! Visit Tea Ave’s website for these delicious teas, and more! And don’t forget to stock up on Rose’s Shortbread here. With summer solstice approaching, the days are getting longer and busier, so we’re back with another tea pairing—one that’s sure to give you a well-deserved boost. My Matcha Life’s Founder and CEO, Calli O’Brien, is as passionate about matcha tea as we are about shortbread, so we knew we’d get along. Matcha is unique in the tea world for the intricate methods used in its growth, harvest and processing. It has also been linked to several health benefits, including stress-relief, alertness, and increased energy. With its exacting process (it takes an hour of grinding leaves to make just one once of tea! ), and its loyalty to the traditions of the Japanese tea ceremony, matcha from My Matcha Life is the best you can buy. Of course, we think it goes perfectly with our shortbread. Matcha tea, unlike other teas, is mixed directly with water, rather than steeped, so that you are drinking the whole tea leaf. Much like the way we make our shortbread, preparing matcha tea is a ritual, best done the traditional way. 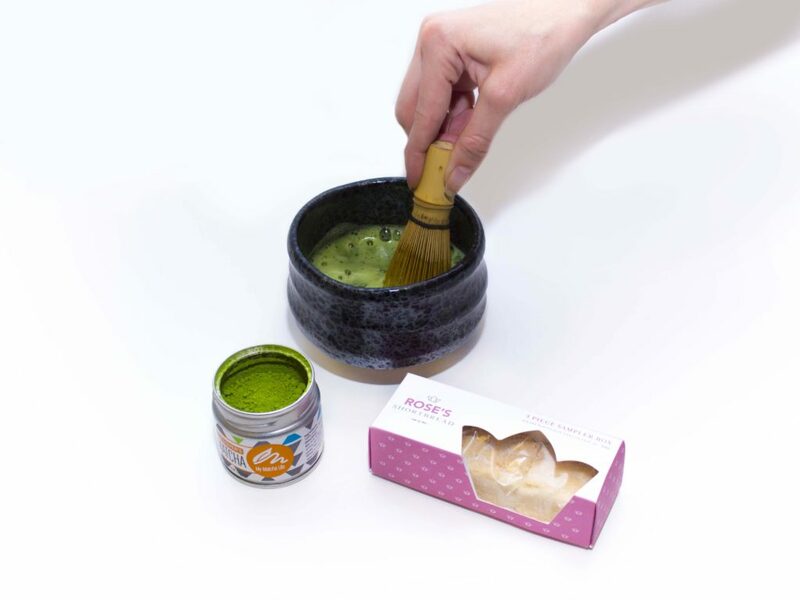 Begin by mixing 1/2 to 3/4 teaspoons of matcha with 30 mLs of hot water in a traditional tea bowl (or something similar), until a paste forms. Add another 60 to 90 mLs of hot water, and using a bamboo whisk (a chasen), whisk in a zigzag motion until frothy. Add more water or other liquid, as desired. My Matcha Life’s 100% organic, ceremonial grade Tea Lover’s Matcha is the perfect match for our chocolate shortbread. The dark, natural cacao tones in our chocolate shortbread pair beautifully with the deep, earthy flavour of the tea. The lingering sweetness of the tea highlights the more obvious butter-and-sugar flavour of the shortbread. Visit the My Matcha Life website to learn more about this unique, feel-good tea, and where you can pick some up. If you’re running low on Rose’s shortbread, you can order more right here. It’s that time of year again—time for bouquets and breakfasts in bed, pedicures and pampering and cards made with love. Yes, Mother’s Day has arrived, and we’re celebrating with a Mom-themed Shortbread Session. 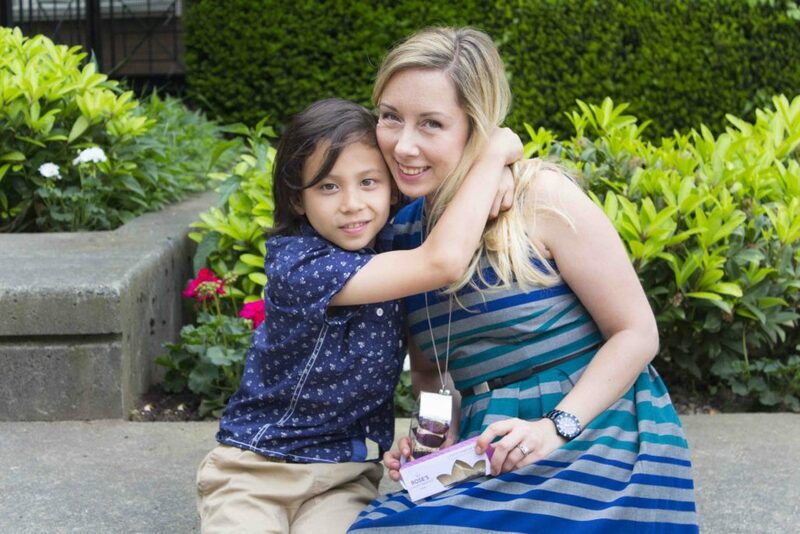 We sat down over some tea and shortbread with Kate and her nine-year-old stepson Zian, to talk about what makes their relationship special. What’s something special that you and your son do together? We like spending time together and our favourite hobby is planting new plants. This year, we’re growing watermelons. That’s what Zian chose. It started because we went easter egg hunting, and Zian ended up with a small carrot plant. And it went well—we kept moving it to bigger and bigger pots. In the fall, we pulled it out and ate it. It was delicious. Was there a time when you sat back and thought, “All of this is worth it.” ? It’s been so many moments like that. I think the first was when we first met. Zian was six at the time, and he decided it was a good idea to climb a tree when his dad went to the parking lot to get the car. I said, “Zian, be careful, don’t fall!” And he replied, “Or what, my dad’s going to get mad?” And I’m like, “Yeah, I think so.” And his response was, “Don’t worry, he’s not your boss, he’s just your boyfriend.” So I already knew that it was going to be fun. It’s been hard work sometimes—we had a rough start. Zian was jealous sometimes that he had to share his dad with me, but we get along perfectly right now. The first time he made me cry (in a good way) was after our first trip to Poland, where we met my family. He started calling me Mama, which is Polish for Mom. And he decided that—nobody forced him. He also made a song for me. Once, I was going out for a coffee with my friend. I had a travel mug that said, “I’m a beast without my coffee.” So when I came back, they showed me the song that Zian made for me. His dad was playing the guitar and he just freestyled the song. It’s called “Love Beast” and he was singing that he loves me like mushrooms, and..
Have you gained something from motherhood that you didn’t expect? I didn’t expect that you can fall in love with a little guy like that. And he makes me feel proud, like when we go out and he’s behaving well, or when people come over and he’s like, “Let me take your coat because you’re the guest.” I remember I taught him that, and it’s really sweet and makes me really proud. We’re just going to celebrate on Saturday, and have a breakfast together on Sunday, then on Sunday he goes back to his other mom. He makes me breakfast in bed. And he makes a card for me. And last year, he planted some flowers for me too. Zian, what’s the best thing about your mom? We travel and have fun together. And she goes on scary rides. Even though she’s scared, she still goes on so we can have fun together. And she teaches me how to plant and cook and cut stuff. Happy Mother’s Day to all the moms out there from Rose and Rose’s Shortbread team! It’s not too late to spoil your mom with our best shortbread selection. This week, the first heat of summer has boldly poked its head around the corner, and we’ve been celebrating with creamy shortbread and some lively pairings from JusTea. As a direct-trade partnership with Kenyan tea farmers, Vancouver-based JusTea does more than sell delicious tea. Since 2012, JusTea has been working with tea farmers in rural Kenya to create a business that benefits the farmers and their communities, while also producing exceptional tea. A local business that values relationships, community and exceptional quality? We think JusTea might be our shortbread’s perfect match. Paul, JusTea’s Tea Captain, has hand selected two of JusTea’s most popular teas for this pairing: African Chai and Kenyan Earl Grey. This tea is re-imagined from the classic Indian Masala Chai. With notes of liquorice root and cloves, the African Chai blends Rainforest Alliance Kenyan Black tea with a unique combination of spices. Rose petals add a floral touch. 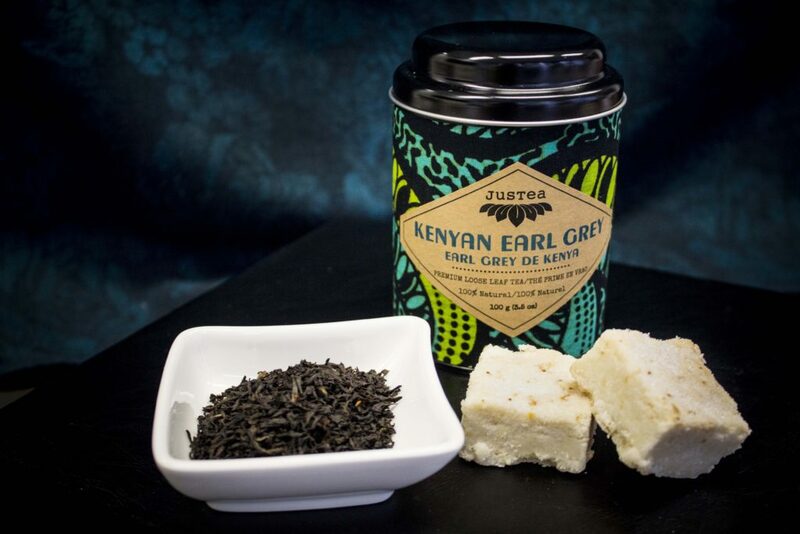 A deceptively simple blend of Rainforest Alliance Kenya Black tea and cold-pressed, organic bergamot oil, the Kenya Earl Grey has a rich, citrusy flavour that will brighten your day. Our creamy lemon shortbread takes the sweet, buttery flavour of traditional shortbread and freshens it up with a splash of lemon zest. With its hint of citrus and its rich, smooth flavour, the Kenyan Earl Grey is a natural choice to pair with this shortbread. The depth of the tea provides a rich bass to the shortbread’s sweet soprano, while the notes of lemon and bergamot dance. Dark chocolate takes centre stage in our smooth, satisfying chocolate shortbread. The bitterness of the chocolate tempers the shortbread’s sweetness, resulting in a robust, indulgent flavour. This rich treat pairs perfectly with the African Chai. The tea’s bouquet of spices enlivens the dark chocolate tones in the shortbread, creating a complex palate that plays well with the biscuit’s simple sweetness. To try these pairings, or create your own, visit JusTea’s website to find out where you can pick some up. And of course, you can order Rose’s Shortbread on our website. It’s spring, which means it’s the perfect time of year for tea and shortbread. The flowers are blooming and the sun is out, but there’s just enough of a nip in the air to call for a nice cup of hot tea. Nothing goes with tea like Rose’s Shortbread, but what sorts of shortbread go best with certain types of tea? 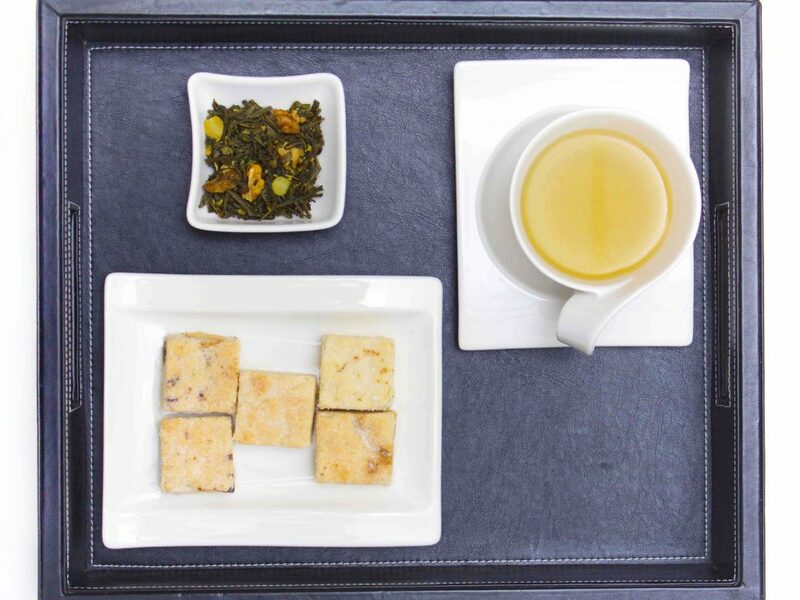 We’ve partnered with a handful of wonderful Vancouver-area tea proprietors to bring you the best tea and shortbread pairings our skilled shortbread sommeliers can concoct. Weddings are expensive, but Vancouver Bridal Swap is helping make them at least a little more budget-friendly.